So EA really is in danger of losing their whole app premium cash cows because in the end they were just too greedy and couldn't stop themselves. ^This. I don't mind microtransactions as long as they serve cosmetical purposes in an AAA game. OR if they help to upkeep otherwise great free games, while giving an advantage to paying players against F2P players. BUT, and this is a huge but, they're so extremely overpriced (I can only refer to SWGOH as I don't play other freemium games) that it's ridiculous. And this is because of the insane greediness of the publisher. Like we need this info, lol. The drop rates are garbage, always was, always will be! Holy ****.... I can't believe they're actually doing this finally. With the advent of the GDPR, they have no choice. Having to shell out of the game and download a pdf, reminds me of the opening scene in the book "Hitchhikers Guide to the Galaxy"
So there is a .10% chance of 145 shards OR 330? Huh? Not really, there is a .2% chance of getting either 145 OR 330 from any single purchase. Clearly there's a rounding error somewhere in those probabilities they posted (probably their code looks like this, but because their randon number generator starts at 0, whereas (ficticious) 10,000 sided dice start at 1, the mistake isn't as immediately obvious that they are dividing by 10,001 rather than by 10,000, but the difference is small enough that it doesn't matter for our purposes. Now, if you want to know what the chance is of getting either 145 OR 330 shards, you can see this happens if you roll between 9976 and 9986 OR between 9991 and 10,001, in other words, 10/10,001 outcomes give you 145 shards and 10/10,001 outcomes give you 330 shards, so (10 + 10)/10,001 = 0.2% chance of getting 145 or 330 shards. Yet nothing but silence. They will have to be forced to show us. They don't have a choice unless they are trying artificially raise the rates to make it look like they are giving a fair chance but if they are **** enough to do that then they really will be in trouble for fraudulent practices. The report that the group I put together has already been forwarded to Google. I had my mom type it up since she teaches business and statistics so it's not some half illiterate piece of work. It is documented every step of the way with pictures before and after so nobody (CG/EA) can cry false. 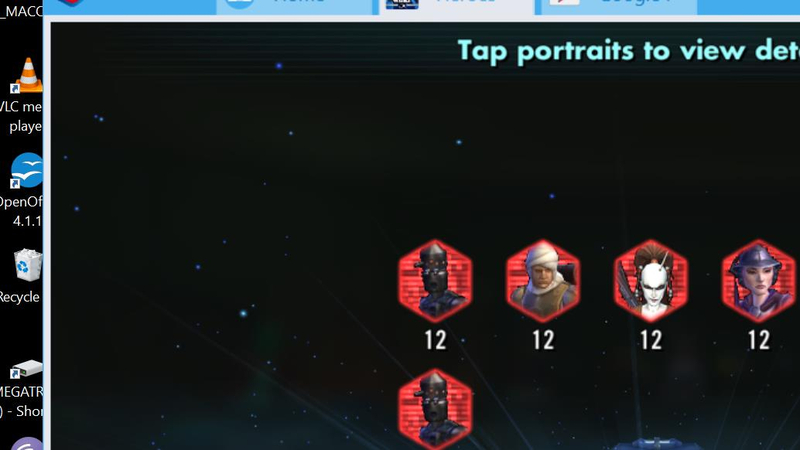 It clearly shows the drop percents for shards in Hard Nodes, Cantina, Ship, and even the high value gear on the nodes. Outside of a few Cantina runs the drop rate was 10% to 15% on 5x run less if toon and ship is on same node. Now with the introduction of 8x that number dropped down to roughly 6%. So yeah they pulled the classic bait and switch. " Oh look guys we increased the amount of node runs!" While laughing behind the scenes that the drop percentages haven't changed so all it did was increase their crystal inflow which equals money. They appease most of the masses who thinks it's a good thing while the small minority of us realized it just made matters worse without them increasing the actually shard drop percentage. Could you provide some of the numbers and data you came up with for Cantina? And maybe share your statistics, sample size, and observations so we can understand the quality of the data? I documented exactly 4001 cantina sims for the probailities of shards and ability mats across all energy costs and graphed their distributions in excel and came up with very consistent drop rates over the course of several months. Cantina shard drop rates across hundreds of sims from 8, 10, 12, and 16 energy cost nodes fell between 29.19-33.39% with an average of 32.32%. I don’t have extended data on hard nodes but I know it is lower than Cantina. I can provide details on ability mat drop rates if people are interested or want to see the hard data. Interesting observation from the data is that 16 energy nodes in Cantina drop purple mats drop at approximately 12x the rate (26.67%) vs. 8 energy nodes (2.23%). Shard drop rates appear to be (and likely are) consistent across all costs, although I would be hesitant to set that in stone as I know my sample size is still too small to model the rng distribution function with complete accuracy. I've had to remove a few posts derailing from the thread topic. This is not a discussion on loot boxes or FIFA. Should it continue to derail, we'll have to follow-up with members individually for breaking the rules. Please respect others looking to use this space for discussing pack probability information. ~ $10 for 7 shards of Jango. Lol! There two things that affect this, The Law of Large Numbers and our Brain. And our Brain always would win. CG was forced to put up the pack probabilities because people were filing refunds in Itunes/AppStore claiming that the probabilities were not shown when they made the purchase. Apple/Google were granting refunds based on this. @cgcarrie @CG_SBCrumb Just a quick gripe, but I feel like the faction pack for old republic is not an equal probability to be any of the old republic toons. I have gotten Bastilla and Jolee many more times than any of the other toons. Oh you mean because the EU requires this because this game and others like it are online gambling. And now you're going to try and sell it to us as a feature? Huh. 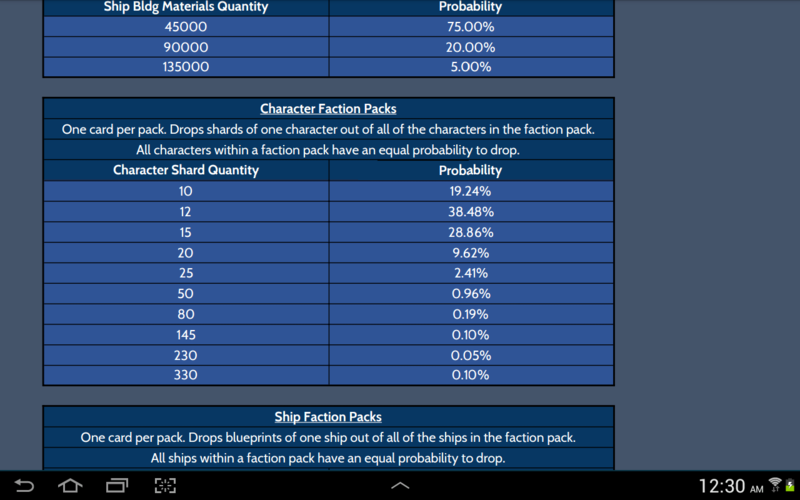 @CG_Carrie FYA.. there are no pack probabilities listed for "Ewok Gear Pack". 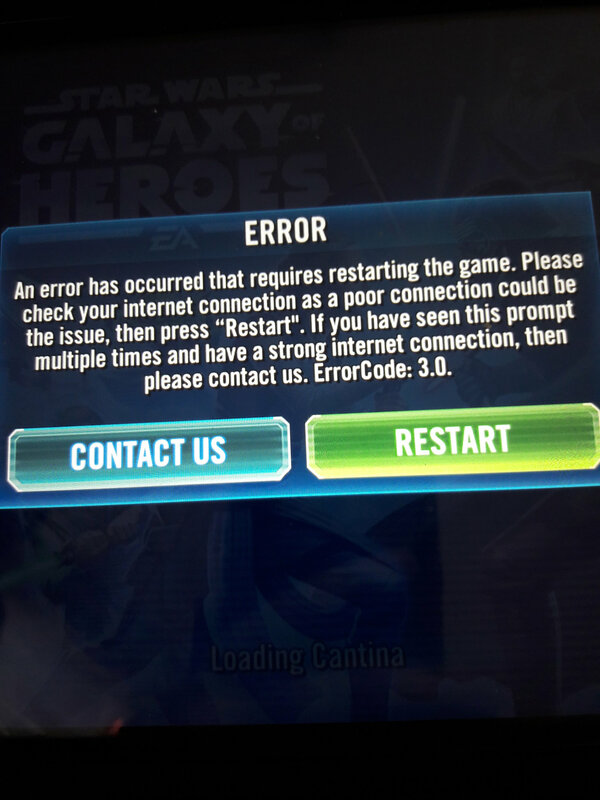 Have had this since last Friday after playing grand arena. Alley code 583 942 148 have done everything to try and fix and what EA Support have suggested and I still get only this message. Please help! Anyone see the jango Thread that Ahnold posted where he spent over300$ for 7 *. Also why is it more in canada and we also get charged with a conversion as well? packs int eh states are 9.99. Up here they are 13.99 (canadian) so more like 15 after conversion. Anyone hungry for balogna? Because I got a bounty hunter pack full of baloney this morning. Wow pack probabilities. Here's my experience with pack probabilities. Everytime they're launched I'll do 1 everyday and receive the least amount that I could possibly get. Out of all the omega and ship packs I've only received more then the lowest possible 3 times. It's a joke. They want you to believe you'll get 25 omegas and 50 mk3 ability mats but it comes down to 9 omegas and 20 mk3 ability mats. I get 1 to 3 zetas a month from the ship challenge packs. Every person in grand arena that I've fought has had 8 to 12 more zetas then me. In other words it's a joke. It's like playing a slot machine for $50.00 and winning $1.00 everytime, and u keep playing because it says u can win $1 million. @CG_SBCrumb @CG_Carrie bounty hunter ship package probabilities?? Yeah it’s great and all but how about making the released rates accurate? Is it really just odds that when you get the bounty hunter ship faction pack you get slave one and hounds tooth 10 times before an IG 2000 and Xanadu pop up? No it's not odds. It's algorithms. Until we see the program algorithms we'll never know.